Above: Full listing of available fluorophores from Abberior. Please click on image to open full-size in new window. Abberior GmbH offers fluorescent dyes and labels that are exceptionally well suited for superresolution microscopy such as STED, GSD, PALM, STORM, GSDIM, SIM, and RESOLFT. They also give outstanding results in confocal and epifluorescence microscopy as well as in single-molecule applications. Our mission is to become the leading supplier for fluorescent labels in superresolution microscopy/nanoscopy. In recent years, fluorescence microscopy has undergone a revolution: the resolution barrier given by the diffraction limit was broken by new microscopy concepts such as STED, GSD, RESOLFT, PALM, STORM, GSDIM. All of these concepts are based on the proper design and utilization of the photophysical /photochemical properties of the dye. Hence, the dye plays a key role for obtaining the ultrasharp pictures with these methods. Based on more than a decade of research experience in superresolution microscopy / fluorescence nanoscopy and a passion for developing new, functionalized dyes for this new era of microscopy, the Abberior team is best positioned to offer fluorophore labels for the most demanding, cutting-edge nanoscopy/superresolution applications. Abberior uses patent-protected technology and will continue to invest into the development of new products. Visit Abberior on-line shop here or click on image below. Vero cells labeled with Anti-Tom22 coupled to Abberior STAR 635P, Abberior STAR 600, Abberior STAR 580, Abberior STAR 440SXP imaged using confocal microscopy. Abberior is pleased to announce its collaboration with Miltenyi Biotec to offer a custom conjugation of Abberior Dyes to primary antibodies from Miltenyi Biotec. 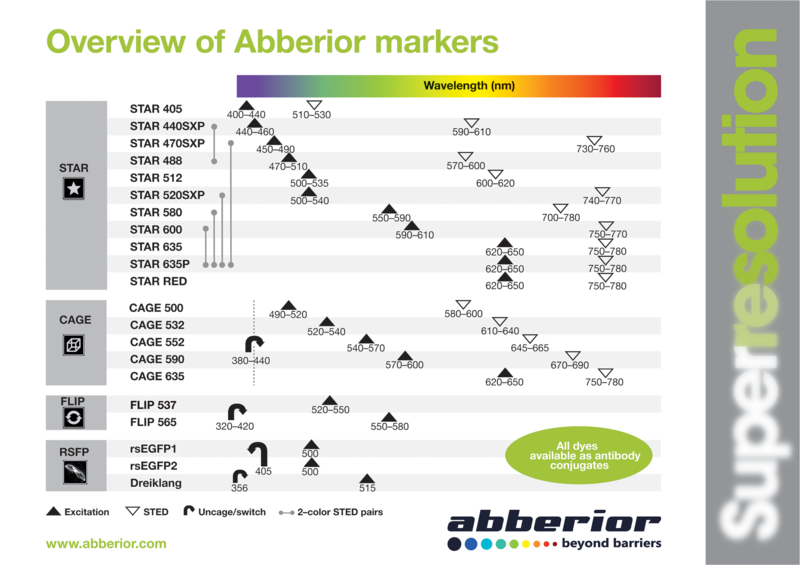 Abberior offers fluorescent dyes and labels that are exceptionally well suited for superresolution microscopy such as STED, GSD, PALM, STORM, GSDIM, SIM, and RESOLFT. They also give outstanding results in confocal and epifluorescence microscopy as well as in single-molecule applications. Now, in addition, customers can use the conjugation service offered by Miltenyi Biotec to get the primary antibody of choice coupled to any Abberior dye. GATTAquant attaches fluorescent molecules at precise distances on an origami structure and mounts them on glass slides. These nanoscale rulers allow researchers to verify the resolution of sub-diffraction-limit microscopes."